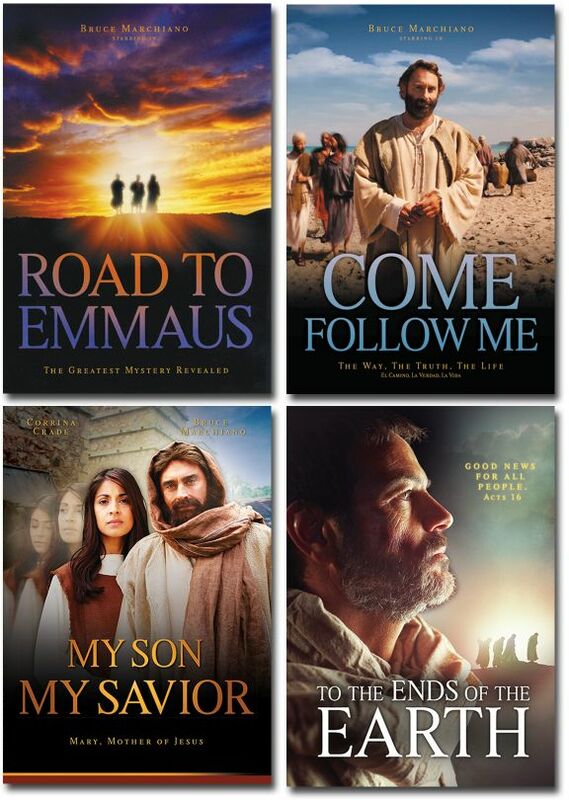 Includes four DVDs on the life of Christ: Road to Emmaus; Come Follow Me; My Son, My Savior; and To the Ends of the Earth. 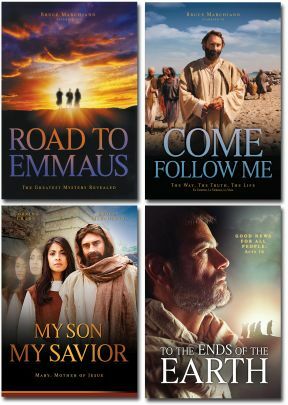 Road to Emmaus — ﻿It is a story that's captivated the imagination of many generations. Mourning the death of Jesus, two first-century travelers were joined by a mysterious stranger. Over the next few hours, the stranger revealed many mysteries that lay hidden in the ancient Scriptures. Soon, the purpose of Jesus’ life became clear...and the travelers’ sadness turned to great joy. Now you can learn what they learned. 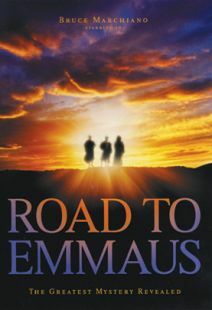 Discover the key to life...on the Road to Emmaus. Starring Bruce Marchiano of The Visual Bible: Matthew and Acts. Widescreen. 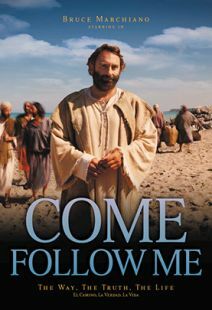 Come Follow Me — Come Follow Me explores what it means to be a disciple, a follower of Jesus by depicting scenes from the life of the Apostle Peter as he journeys with Jesus. Peter's story is full of misunderstanding, false pride, misplaced zeal, doubts, fears, and even denial. This short film traces Peter's rocky journey from the day he heard Jesus call his name to the post-resurrection conversation in which Jesus charges Peter to “feed my sheep.” Over time Peter was transformed from fearful denier to the bold leader of the early church. The answer for Peter, as it is for followers of Christ today, was found in the power and promise of Jesus' words. The film is also designed to be an effective evangelism tool. Those without much biblical knowledge will be given a excellent introduction to the gospel message and invited to Come and follow Him. 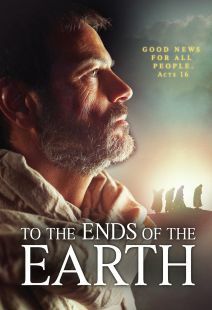 From the award-winning producers of The Road to Emmaus, Come Follow Me stars Bruce Marchiano (Visual Bible Series, The Encounter) as Jesus and Emilio Doorgasingh (Apostle Peter and the Last Supper, Kingdom of Heaven) as the Apostle Peter. Includes English and Spanish audio and English captioning. Widescreen. 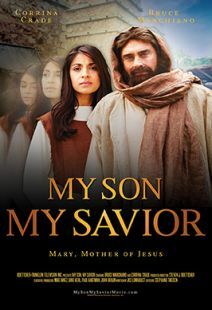 My Son, My Saviior — From the makers of the award winning biblical dramas Road to Emmaus and Come Follow Me comes My Son, My Savior, a powerful portrayal of the life of Jesus as seen through the eyes of his mother, Mary. My Son, My Savior imagines Mary’s childhood, growing up in a strict Jewish household, celebrating the annual feasts such as Passover and hearing the prophecies about a coming Messiah who would redeem Israel. Little did she know the vital role she would play in the fulfillment of those prophecies. Using the Gospel accounts as its framework, we see how Mary responded to the events of Jesus' life and how her understanding of Jesus’ mission grew over time. The film is created to be a powerful evangelistic tool, bringing the Gospel story to life from a unique perspective. Widescreen. To the Ends of the Earth — What must I do to be saved? That was the question asked of the apostle Paul nearly 2,000 years ago. His answer resonates to this very day. Follow Paul's remarkable visit to the city of Philippi as he connects with people from all walks of life, demonstrating that the good news of Jesus is indeed for all people--to the very ends of the earth.